OTTAWA, ONTARIO—Hotels have always explored ways to more effectively communicate with guests. Whether through the use of technology or face-to-face exchanges, interactions between hotel employees and guests are always evolving. What may have been important to a guest 20 years ago may not be a priority today, but one thing is for certain—guests will always have needs hotels will have to fulfill. Seeking to supply the direct mode of communication between both sides of the conversation, Benbria, a mobile messaging and engagement solution geared toward improving customer experience, is targeting two industries: restaurant and hospitality. For hoteliers, Benbria offers its Loop hospitality solution, which includes two products: Loop Messenger and Loop OnDemand. Combined, the mobile suite is designed to assist employees with engaging with guests, increasing revenue and improving operations. Loop Messenger, marketed as a one-on-one instant messaging solution for hotels, enables guests to use personal devices to leave comments or ask questions. It will then notify the appropriate staff member of the request. An automated, menu-driven solution, Loop OnDemand allows guests to request commonly needed items, such as towels. Requests are then auto-routed to the relevant team members. That being said, Loop is designed to integrate with a range of guest-facing solutions, including a property’s existing app for guests. It can also be accessible from in-room iPads or tablets. Loop also integrates with more than 60 different PMS, CRM and ticketing solutions. “Essentially, if a client has a vision for guest engagement across multiple platforms, chances are Loop can integrate into it,” he explained. Need an extra towel, message the staff with Benbria’s mobile messaging and engagement solution. The software company’s products have been influenced in many ways by existing clients. To gather feedback, Benbria attempts to stay highly active in the industry it serves. 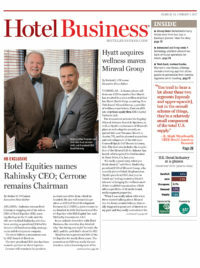 For example, with the hospitality industry in mind, the company held a series of roundtables with the International Luxury Hotel Association and Cornell University. “We gathered some excellent insight through this process to better understand the challenges the industry is facing when it comes to mobile devices and the guest experience,” Geneau noted. Benbria additionally published a whitepaper on its findings. 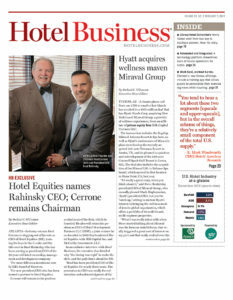 Some of what the software company gained from its discussions with industry leaders: messaging and texting can present a challenge to hotel employees, and using bots and AI to respond to guest needs isn’t something the entire industry is confident in. There’s an underlying fear for many of losing the human element part of hospitality. To date Benbria has more than 180 clients using its solutions, with more than 1,691 locations around the world. Included on its customer list are enterprise-level companies such as Sandals and Royal Caribbean, and a network of independent luxury hotels. Loop also allows guests to communicate with the property while they’re returning home, a feature many of Mutton’s guests have leveraged—especially for providing feedback and making special requests. “We had one memorable occasion of being able to locate a valuable and sentimental piece of jewelry that was inadvertently left behind by a guest; their quick yet detailed loop message we received allowed us to track down the valuable item within minutes and subsequently returned it safely home,” he recalled. When asked about Benbria’s plans for the hospitality industry in 2017, Geneau admitted there’s just “too much to list.” Some of what the company learned from industry leaders in the past year is being incorporated into future releases. Expected enhancements include adding more tools to its data and reporting features targeting operational goals.